Het Wilde Weten welcomes you to a screening of As the lake said to the boat, a film made in collaboration between Edward Clydesdale Thomson, Frans-Willem Korsten and Sjoerd Westbroek followed by responses from Clare Butcher and Jack Segbars. Two excellent cooks and one man who knows how to clean decide to meet near at the edge of the woods. Or should one say: a skilled photographer and two learning cameramen; an established scholar and two artists; a beginning philosopher, a cinematographer and a former playwright? They are there to make a short movie, called ‘As the lake said to the boat’. During a conflictuous diner they decide what their film is to be about. At the centre of their debate is a camouflage suit that is perfectly ‘suited’ to make one blend with nature. So they go out to explore the area. They detect a lake filled with water that can be emptied out, and another lake that should not contain any water. They discover that a camouflage suit is no good on a golf course. 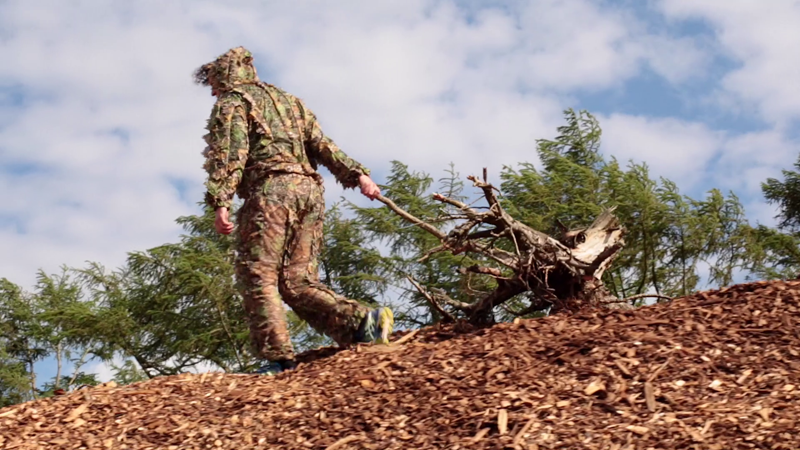 They climb mountains of wood chips. And then they hit the jackpot: a famous, one kilometer long running-horse track in Lippenhuizen. Here their film finds its dramatic conclusion in a never ever before performed experiment with themselves and the camera. Edward Clydesdale Thomson (1982) is Scottish and Danish and lives and works in the Netherlands. He graduated with a Master’s Degree from the Piet Zwart Institute in Rotterdam and followed the BArch programme at Glasgow School of Art. From 2011 to 2012, he was a resident at the Rijksakademie van Beeldende Kunsten in Amsterdam; and in 2011 he won the Lecturis Award and was nominated for the Prix de Rome. In 2013 he was resident at iaspis, Stockholm and in 2014 at the Irish Museum of Modern Art, Dublin. Edward Clydesdale Thomson’s work was shown in the solo exhibition Causa Finalis (2012) at Galerie Fons Welters, Amsterdam; the Prix de Rome 2011; SMART Project Space, Amsterdam; and Secret Gardens (2012), TENT, Rotterdam. Nothin’ Shakin’ but the leaves on the trees, Marabouparken, Sweden. Sjoerd Westbroek (1979) lives and works in Rotterdam. He graduated in 2008 with a Master’s Degree from the Piet Zwart Institute in Rotterdam and in 2013 was a resident at the Jan van Eyck Academie in Maastricht. Recent projects include The Building a Pedantry of Lines at the Jan van Eyck Academie and Pick up this book, an installation and publication for the exhibition If Mind Were All There Was, Kunstverein Göttingen. Sjoerd Westbroek is co-founder of ADA (Area for Debate and Art) in Rotterdam. Frans Willem Korsten is Extraordinary Professor of ‘Literature and Society’ at Erasmus University and Associate Professor for the study programme ‘Film and Literature Sciences’ at Leiden University. Together with Yasco Horsman, he founded the Leiden Platform for Literature, Law and Rhetoric. Clare Butcher (Zimbabwe) is a teacher and curator who cooks. She arranges reading, writing, and research sessions with students at the Gerrit Rietveld Academy and the Piet Zwart Institute’s Masters of Education in Art & Design programme. Her own education includes an MFA from the School of Missing Studies in 2015, a Masters in Curating the Archive from the University of Cape Town in 2012, and participation in the de Appel Curatorial Programme in 2008/09. Other collaborative and individual endeavours include a position as guest curator with the Van Abbemuseum, where she served as co-curator of The Autonomy Project (2010¬¬–12); Men Are Easier to Manage Than Rivers (2015); Historical Materialisms (2014–); Every Great Undertaking Has Its Ups And Downs (2014); Scenographies (2013); The Principles of Packing… on two travelling exhibitions (2012); and If A Tree… on the Second Johannesburg Biennale (2012). Jack Segbars is an artist and writer. He is a PhD-researcher at PhDArts (Leiden University/KABK The Hague). He is primarily engaged with the conditions and parameters within which the concept of art is created. The interconnections between the different positions (critic, writer, curator and visual artist) are unified in his persona, and are explored as artistic investigation. In 2009 he produced the publication Rondom-All around the periphery (Onomatopee) that deals with the overlap of positions and domains in the set-up of art production. In 2012 this was followed by Inertia, a travelogue of visits to Palestine in which the theme of artistic engagement is addressed. Next to his praxis as visual artist, Segbars regularly writes reviews and articles on art and art-related subjects including Metropolis M.